The multifunctional jet / spray branchpipes (according to DIN EN 15182-3) make it possible to choose full jet or variable spray from the shut-off position. Symbols of the control settings - which can be seen or felt - are provided on the body. Branchpipes with full jet lock "VSP“ protect the fireman when fighting fires in electrical installations, as well as avoiding unneccessary water damage. Provided the safe distance is maintained, the spray is not electrical conductive. Switching over to position 'jet' is only possible by pressing the locking trigger on the handle. Simple, robust construction, not sensitive to dirt. Easy to flush simply by changing over from jet to spray pattern. Spray angle and droplet size can be variably selected in case spray position is set out of center. Not to be used indoors. 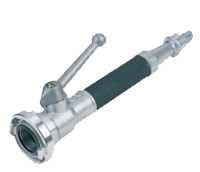 Pipe and tip made of impact resistant polyamide.The branch pipe does not include a coupling.